Has an Alien TV series been picked up by a mystery streaming service? We can immediately chalk this up to a rumor that we would all probably like to be true, but for the time being, can only regard as a very intriguing bit of hearsay. In any case, that is indeed the rumor floating around right now. That opens up a whole host of additional questions, but if there is even a nugget of truth to this, it could be just what the franchise needs right now. We first got wind that a TV series based on Ridley Scott's Alien franchise may be in the works just ahead of San Diego Comic-Con over the summer. Even at that point, it was nothing more than a rumor and still has yet to be confirmed by anyone at Fox, who currently controls the franchise. In any case, a new report from Mr H Reviews states that his "very reliable" anonymous source has confirmed that the show is a go and that it has already found a home at a streaming service. Here's what he had to say about it. "This source is very reliable. They have told me that the Alien TV series is definitely happening. It has found a streaming service. There is no other information outside of that." There are so many unknowns here even if this bit of the rumor is true. The biggest question being, what streaming service stepped in and picked the show up? It's anyone's guess really, as Netflix, Amazon, Shudder and a host of other services are all gunning for premium content to draw in subscribers. The second question is, what would the show be about? Based on what we heard over the summer, it likely wouldn't be centered totally on Xenomorphs, as that would get very expensive and possibly run out of steam very quickly. So, Colonial Marines doing their thing in space? All we can do is speculate. One key thing to bring up is the pending Disney merger with Fox, which is expected to close as early as January. Disney is purchasing most of Fox's assets and that will put them in control of the Alien franchise once the deal closes. However, for the time being, Fox is operating as they normally would, to some degree, continuing to develop and produce both movies and TV shows until such time that the merger does close. 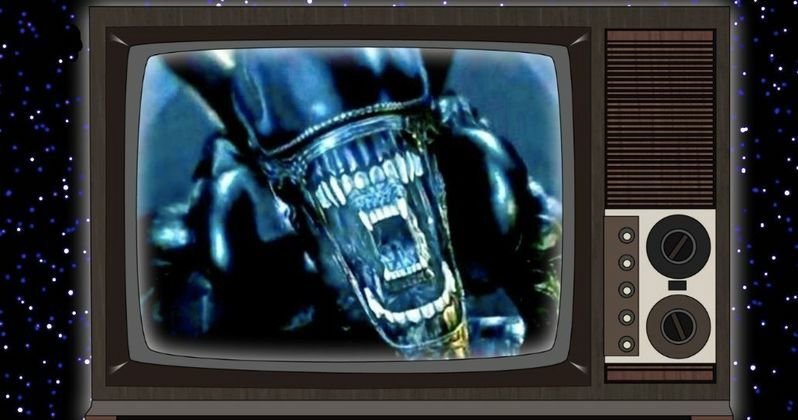 Related: 2 Alien TV Shows Being Planned, One from Ridley Scott & Hulu? Another thing worth bringing up; Disney will own a controlling stake in Hulu once the deal closes. Since Alien maybe wouldn't be a good fit for the upcoming Disney-branded streaming service, perhaps it would make a nice fit for Hulu, which already is host to more adult-oriented shows like The Handmaid's Tale and Castle Rock? Just a thought. For now, it's only a rumor. But if it becomes more than that, we'll be sure to bring you any new info as soon as we can. Feel free to check out the clip for yourself below from the Mr H Reviews YouTube channel.